My winter break is drawing to a close and I haven't finished anything I wanted to over the break. No games were finished. No shows were caught up on. 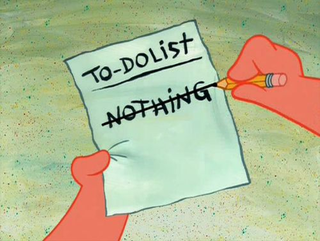 In fact, my list of things to do has only grown. I have an even larger pile of games to play and even more shows to get caught up on. Argh! I start working on a game and then I get a bunch of new ones and play a little bit of each one but can't just sit down and get through one. Or I want to get back to watching on show but I start watching a new one instead. I guess I have a short attention span or something. So how about you guys? If you had time off, what did you get accomplished? What do you do to motivate yourself to get through your to do list? What games, shows, movies, books, etc. are on your radar that you've been meaning to play, watch, or read but haven't got to yet? Discuss this topic below or feel free to Talk Amongst Yourselves about whatever!